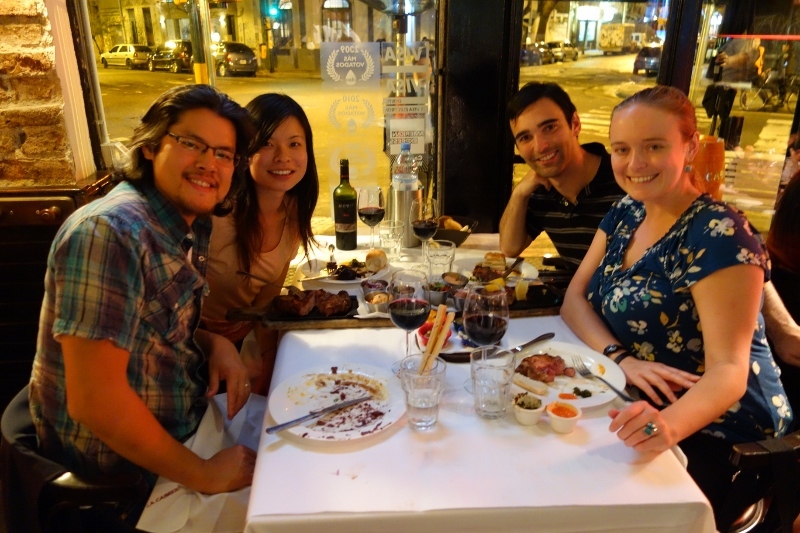 Before Jason and I arrived in Argentina, I emailed my colleague (who is Argentinian) to pick his brain on what to eat. He sent back an amazing list of what to eat and we pretty much followed it word for word. Actually it was so descriptive, I’m going to let him help me write about the awesome food in Buenos Aires (his words in italicized blue font). 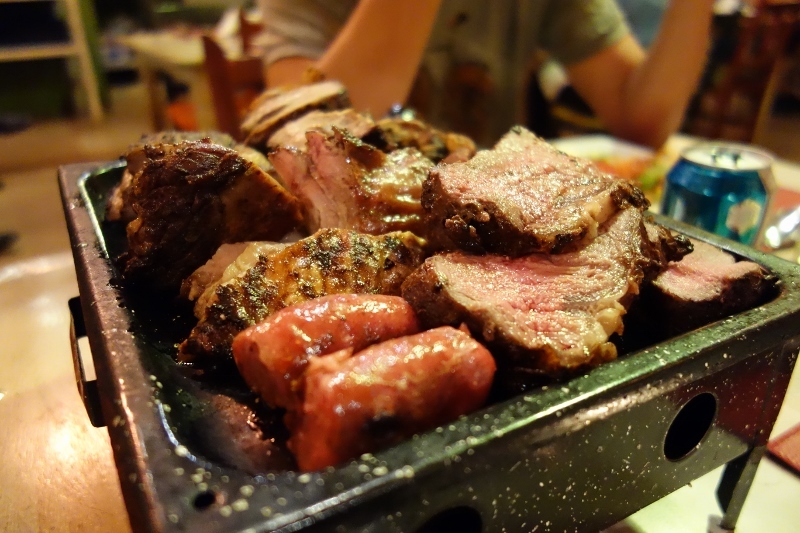 Even though I’m not the biggest fan of meat, I really enjoyed the parilla restaurants in Buenos Aires. 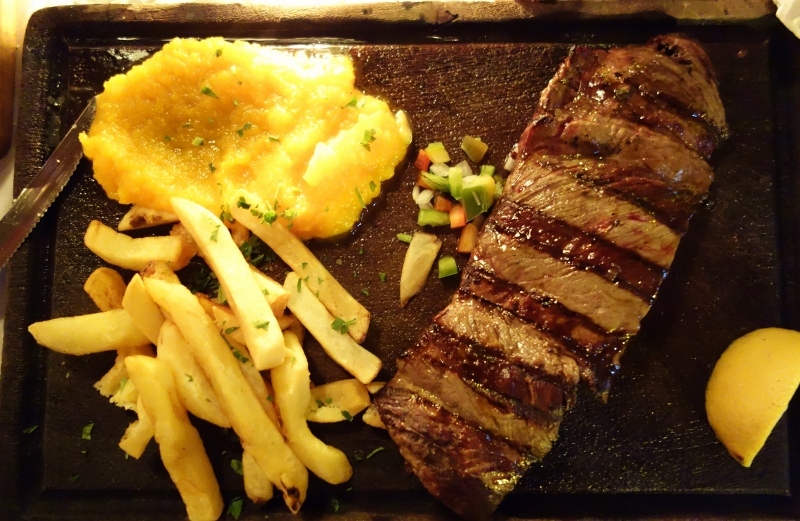 Parillas (Spanish for ‘grill’) basically serve grilled meat and animal parts. 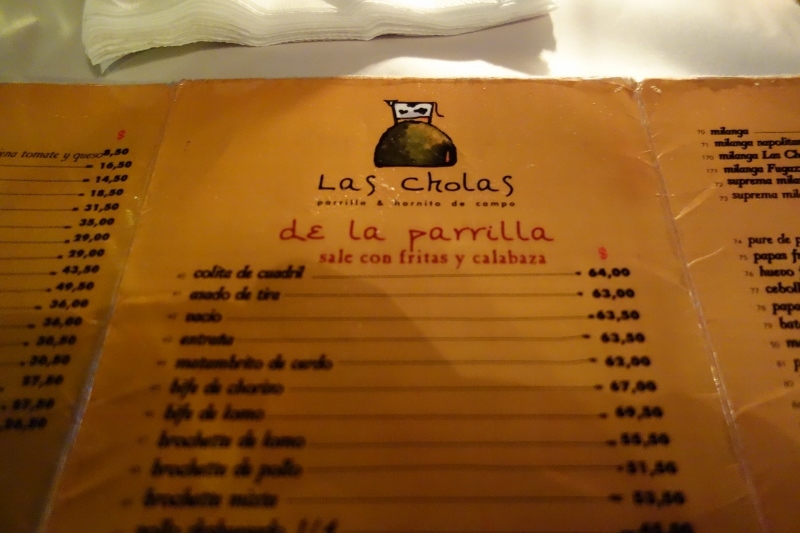 Our first visit to a parilla was to Las Cholas in the Las Canitas neighbourhood. It was probably our favourite parilla. They didn’t give us a choice as to how we wanted the steaks prepared (they prepared the steaks well-done), but it was still so delicious! It’s served with a side of Chimichurri sauce (a sauce of herbs, garlic, and vinegar) – which is perfect for the steaks. Never turn down Chimichurri sauce if you’re offered some. We had parilla again a few weeks later at a restaurant called La Cabrera. They had an awesome happy hour deal where between 7-8pm, everything in the restaurant is 40% off. 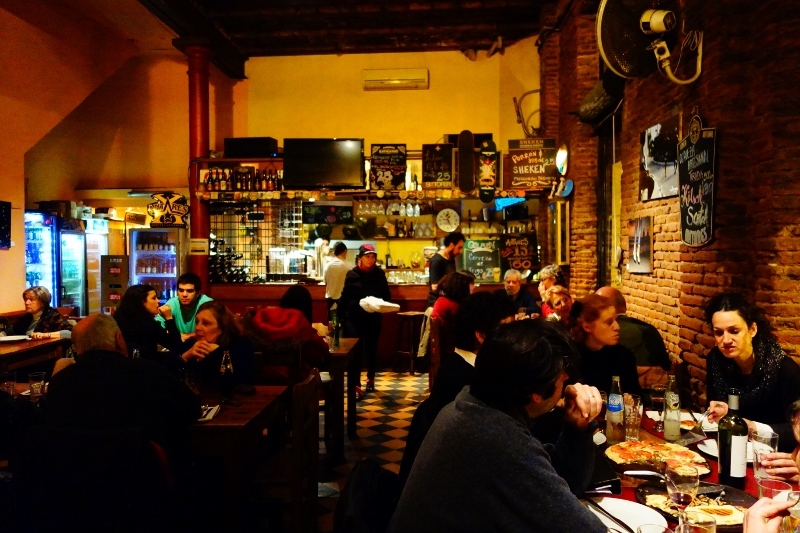 No one in Buenos Aires has dinner earlier than 8pm (with the exception of tourists), so it was a clever way for the restaurant to generate some additional business and a great deal for tourists. 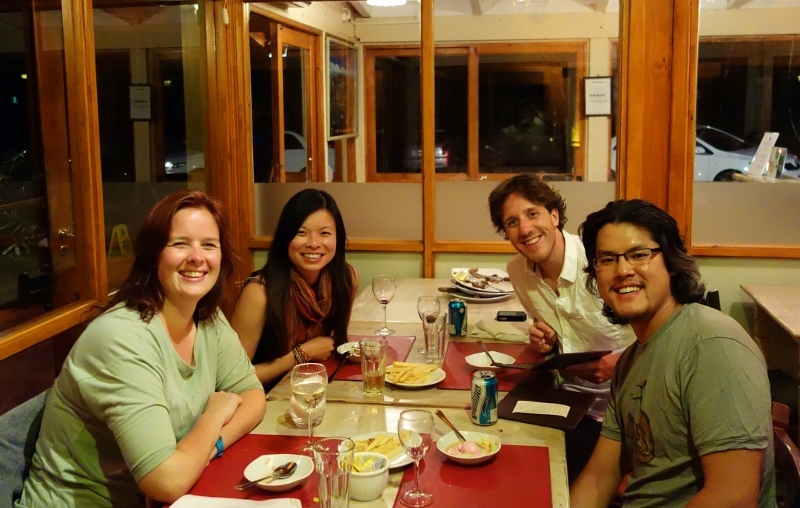 We had met a fun couple from California in Patagonia and we decided to meet up again in Buenos Aires for dinner and drinks. Christina and Scott had both just finished writing the Bar and were travelling for 7 weeks before starting their careers in law. Jason and I ordered the ribeye steak. They even let us choose how wanted it prepared (medium). We had parilla again at our hotel in Puerto Iguaza, La Cantera. It’s a quiet hotel in the middle of the jungle in the city by Iguazu Falls. We met this interesting Dutch couple (Yoost and Guusha) who was travelling for four weeks before they moved from Holland to Ontario for work. We had a great time with them over dinner. The restaurant actually had to kick us out because we wouldn’t leave. We tried the blood sausage, glands, and intestines. Very interesting flavours – I liked the blood sausage and glands. The intestines were a little too weird for me. Guusha wouldn’t even touch the animal parts. Yoost was brave enough to try them out. He, too, thought the intestines were a bit weird. 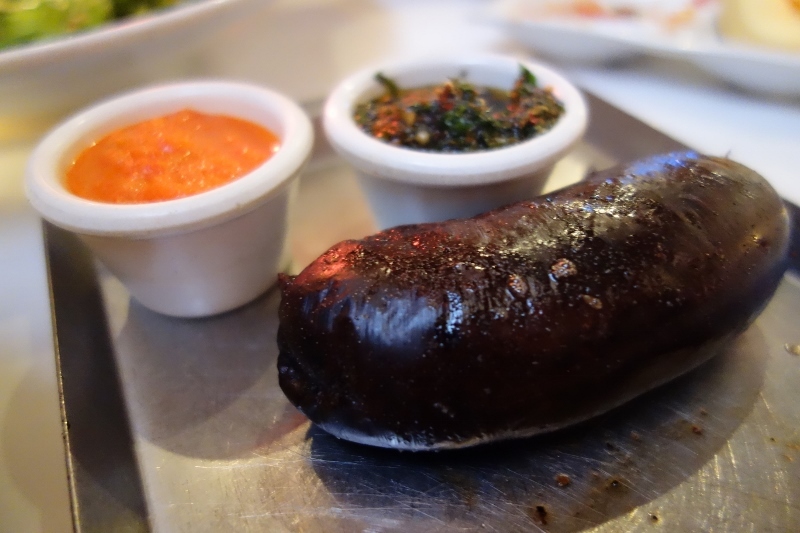 I liked the blood sausage so much that I tried it again when we were back in Buenos Aires. This was divine. 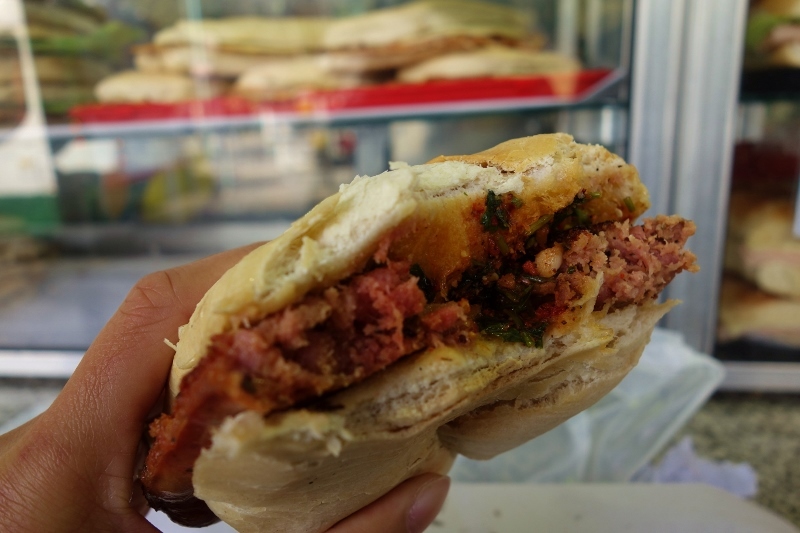 They weren’t as easy to find as street meat is in Toronto, but when we had our first one, we both let out a sigh of delight. 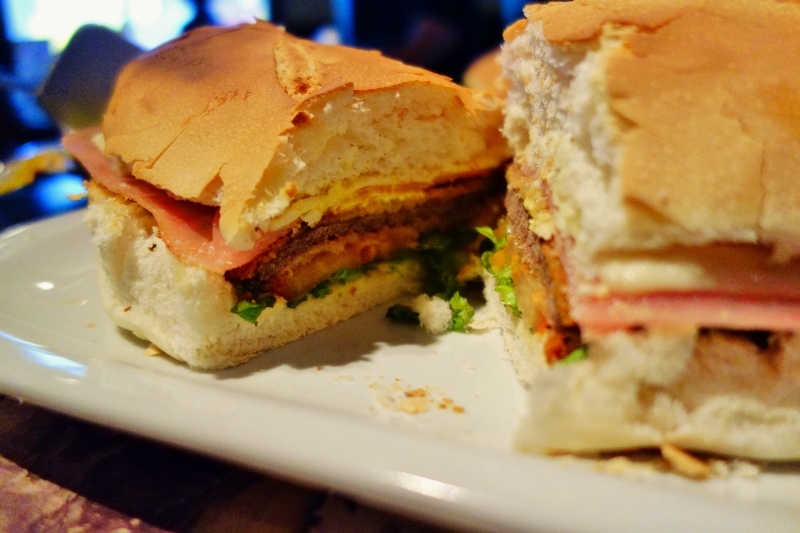 Choripans are grilled sausages, covered in the magical Chimichurri sauce, and served on toasted buns. 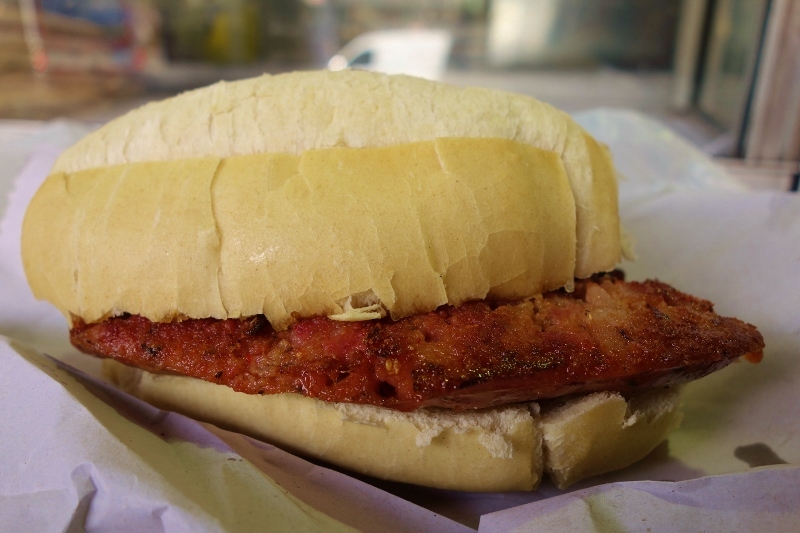 I think I’ll have to write to the city councillors in Toronto to petition for the replacement of all Toronto street meat with Choripan. You can see the delicious Chimichurri sauce in this picture. 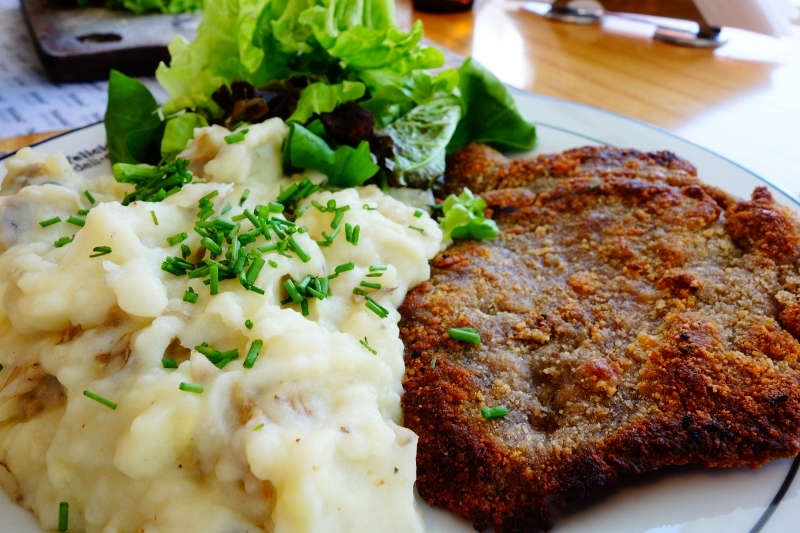 Milanesas – like a schnitzel but better. I had these ones for breakfast – twice. I had this one for lunch one day. And this one I had for dinner. You have to go eat ice cream from Freddo’s, you will be amazed that you have never eaten ice cream that good before. I’ve lost count of how many times we’ve had Freddo’s ice cream by now. 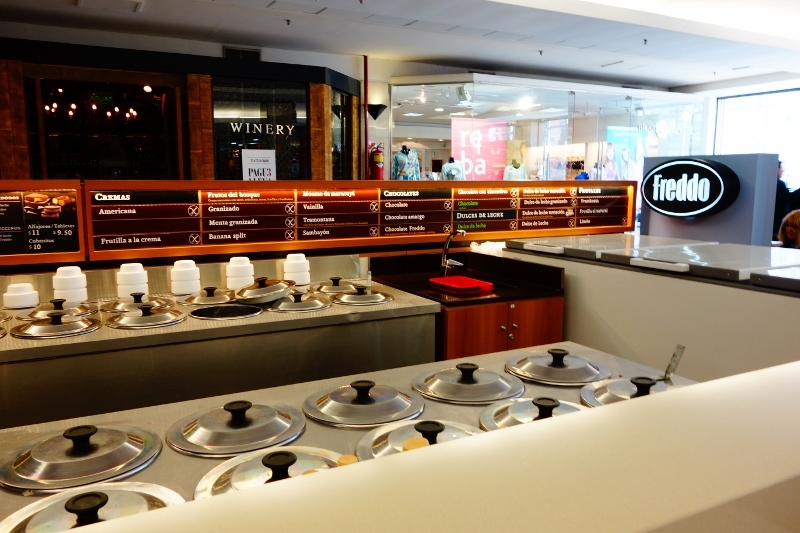 It probably is the best ice cream we’ve ever had. 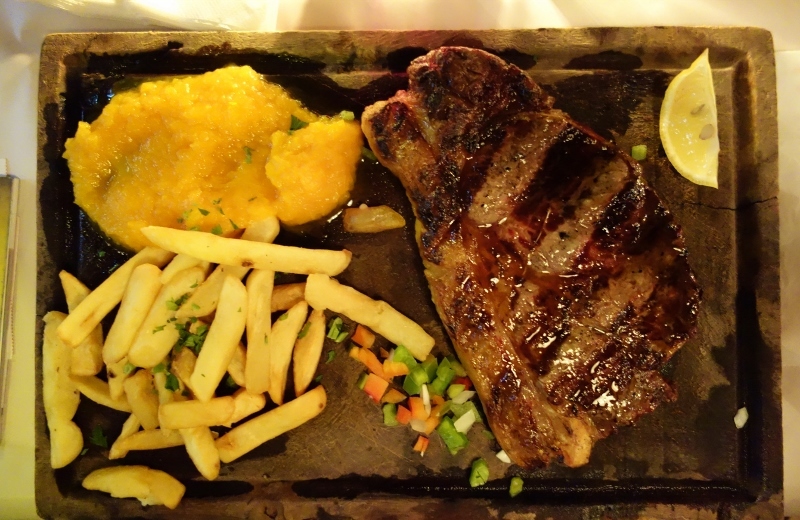 Each time we had it, we ordered the 1/4 kilo serving. And each time, we wished we’d ordered the 1/2 kilo after we inhaled the 1/4 kilo in about 5 seconds flat. 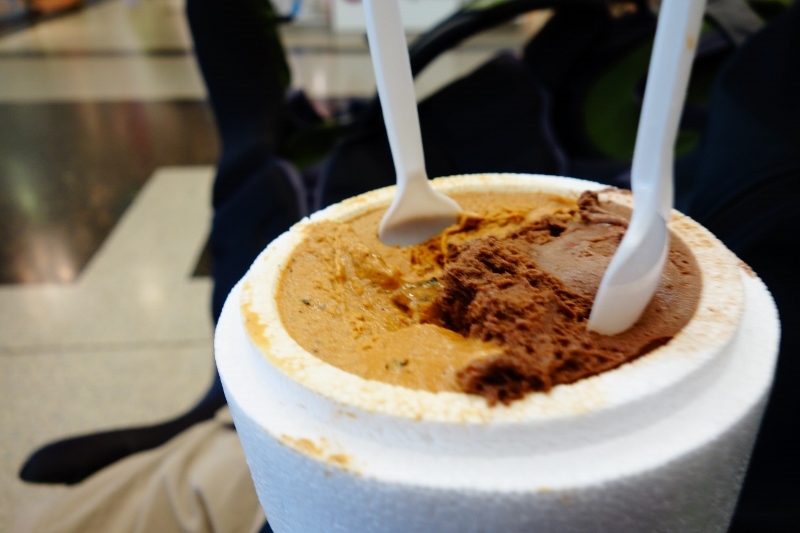 This is a 1/4 kilo of heaven Dulce de Leche and Chocolate with Almonds ice cream. 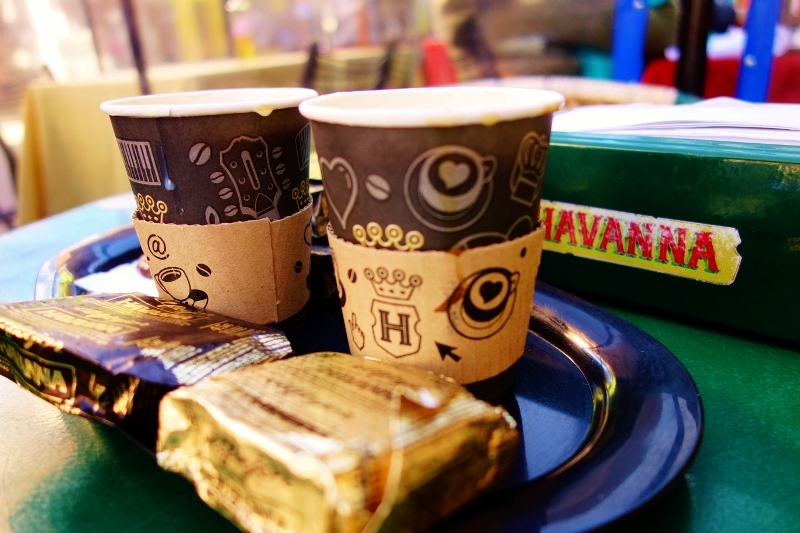 Alfajores – the best ones hands down are Havanna. They have little stores you can find that sell these. Yup, the best ones ARE Havanna. 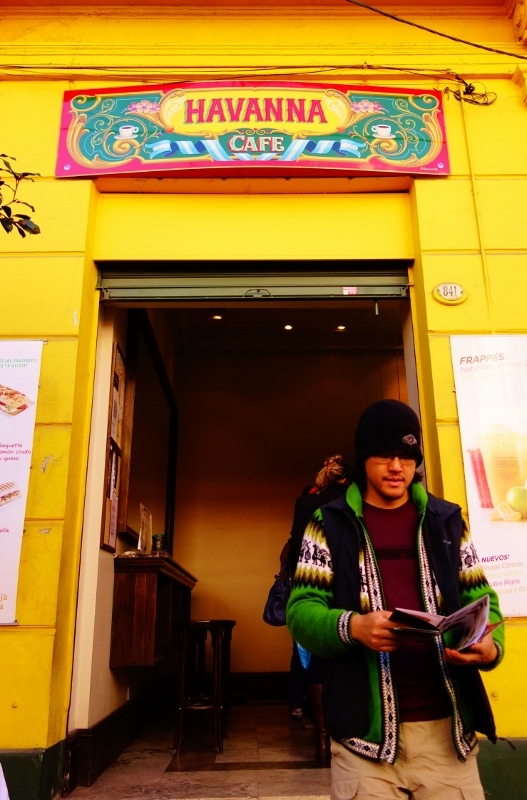 We stopped at a Havanna cafe in La Boca and ordered four alfajores. Don’t let the size of these little sweets fool you – they are very filling. We only finished two. Along with the Havanna alfajores, we ordered coffee with dulce de leche. It really is perfect. Coming to Argentina, I didn’t have much of a sweet tooth but I am leaving this country with one (or five). Alfajores and Dulce de Leche coffee. I think I got a cavity just from looking back at this picture. 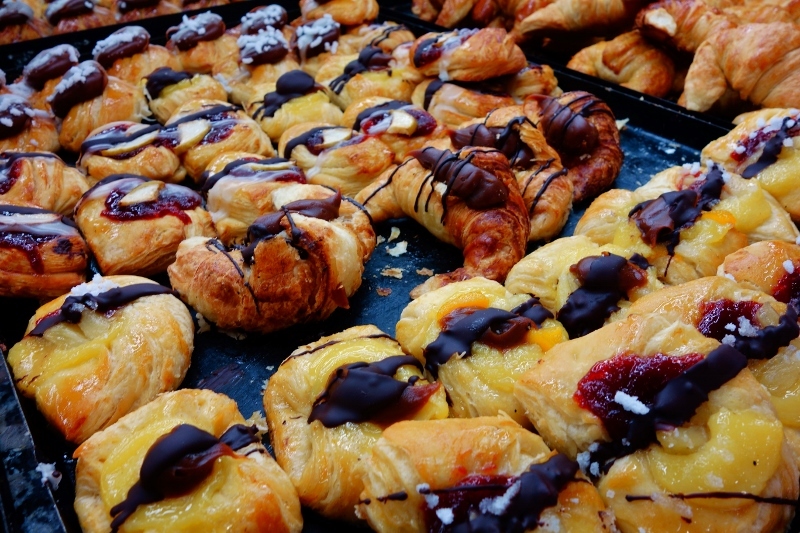 Facturas – pastries but better. The ones filled with dulce de leche are my faves. Anything filled with dulce de leche is my fave. My newly developed sweet tooth craved facturas all the time. They come in all different sizes and shapes and they’re all good. In addition to the list my colleague provided, we also got a lot of recommendations from locals to eat lots of Argentine pizza and empanadas. Argentines are very proud of their pizza. 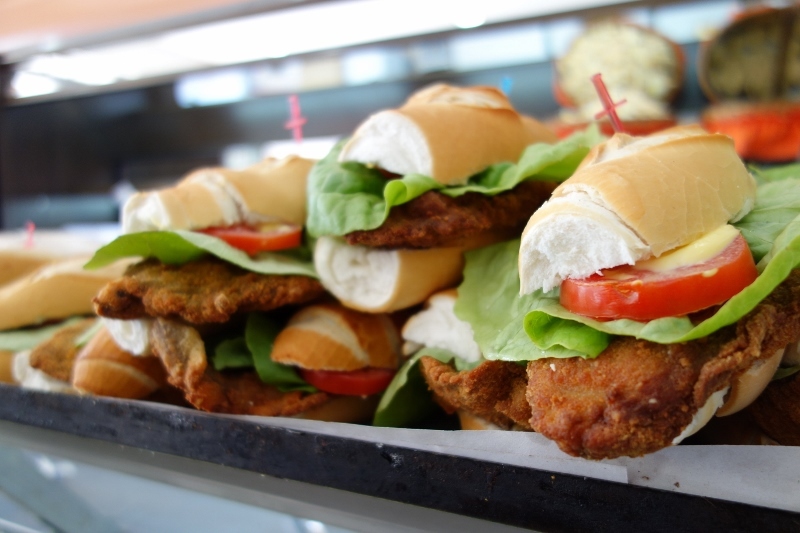 The immigration from Naples and Genoa at the end of the 19th century brought this food over, but since then Argentines have made it their own. 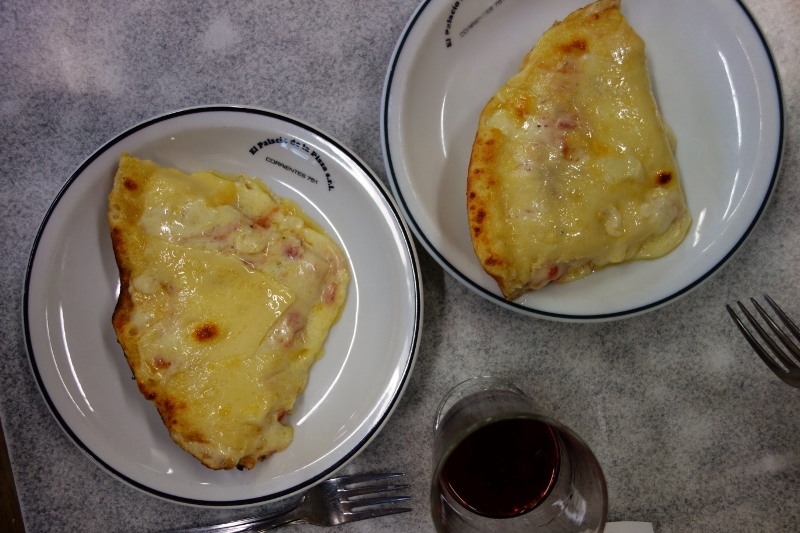 There are two main types: Pizza a la piedre (on a stone oven) is similar to Neopolitan pizza. It has a crispy thin crust. Or the traditional pizza molde which has a spongey, chewy thick crust. 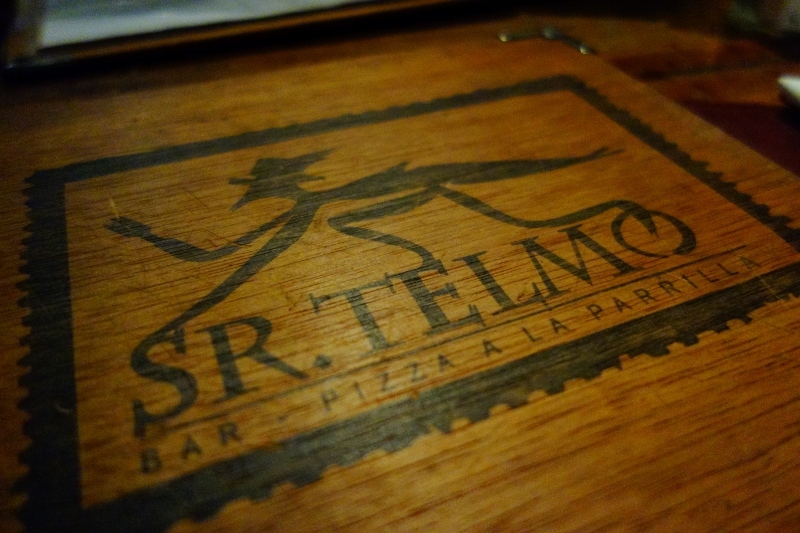 For really good pizza a la piedre, we went to a popular little joint in San Telmo, called (what a surprise!) Senor Telmo. We arrived literally 2 minutes before the dinner rush (9:30pm). All the groups behind us had to wait over an hour for a table. We were seated within 10 minutes. We asked the server for two recommendations and we went with both: arugula & jamon crudo, and pancetta & mushrooms. They were delicious but I’ve been spoiled by the really good Neopolitan pizza joints in Toronto so I wasn’t that blown away. 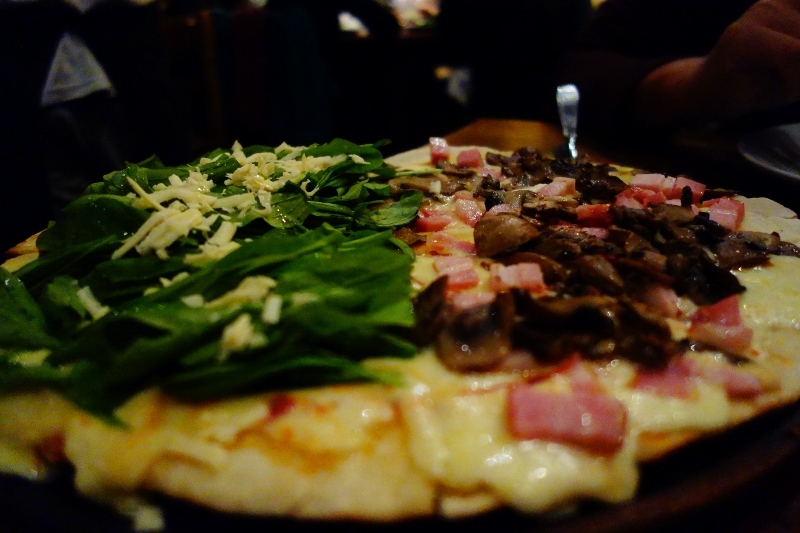 For the traditional Argentine pizza molde, we were advised to go to El Palacio de la Pizza (The Palace of Pizza…I know, it’s cheesy! Get it? Cheesy, Pizza? haha). 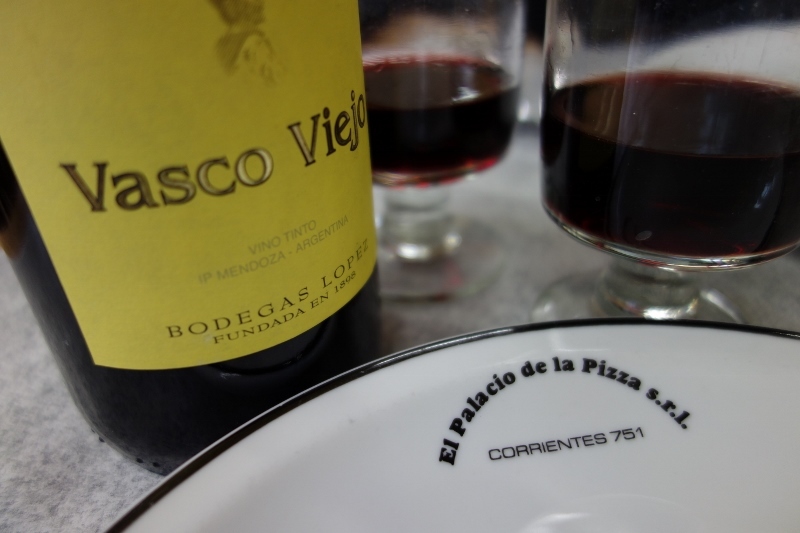 I typically like to enjoy my pizza with a cold beer, but Argentines love to enjoy it with wine. So we split a bottle of red. We were also advised to order the provolone pizza. Thick, chewy, and smothered in infinite layers of provolone and mozzerrella. It was deliciously artery-clogging. We ordered a medium pizza and both of us couldn’t finish our second pieces. 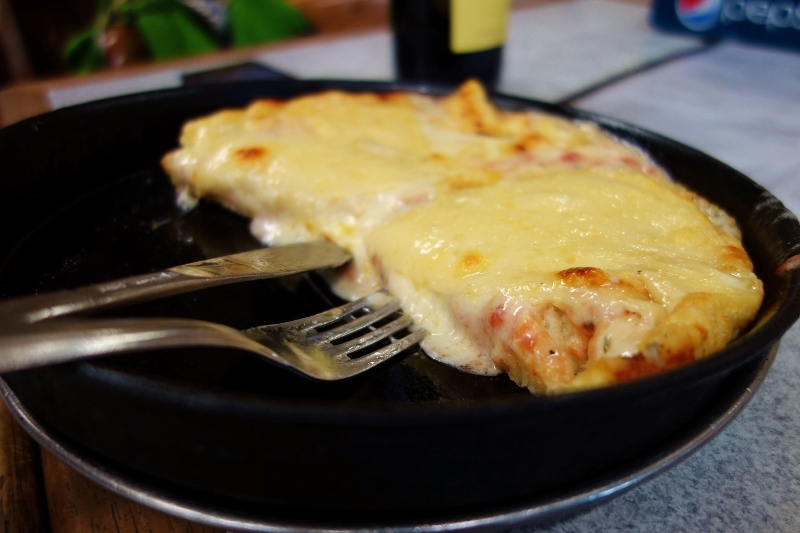 Provolone pizza. The medium size comes with 4 slices. Two people will likely only be able to finish 3. It kind of reminded me of Chicago’s deep-dish pizza. Side view of our pizza. We stayed in the Montserrat neighbouhood for a couple of days, and our host (Ruy) recommended we go to a local pizza joint (closest intersection is Salta & Venezuela) for their empanadas. He described them as little cheesy pockets of pastry perfection. I ordered the Roquefort (which I highly recommend) and Jason ordered the ham & cheese. Ruy wasn’t kidding – they were perfect. 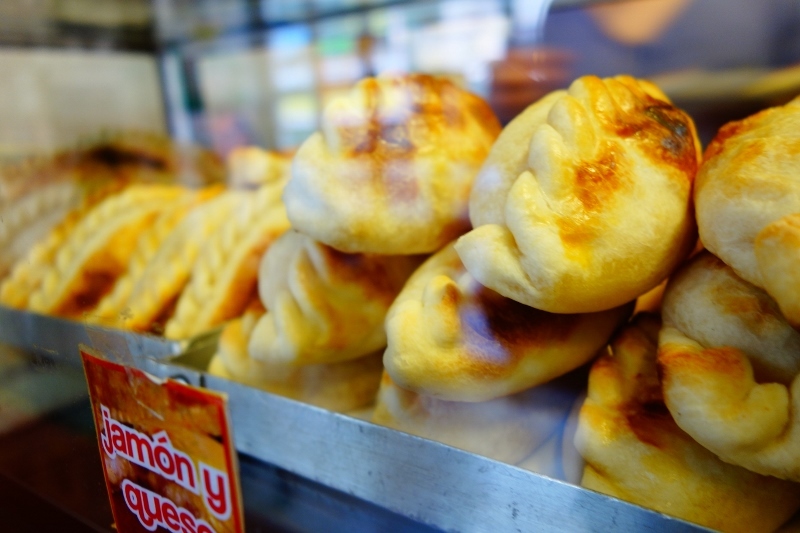 We’ve had dozens upon dozens of empanadas since that first one and none have measured up. 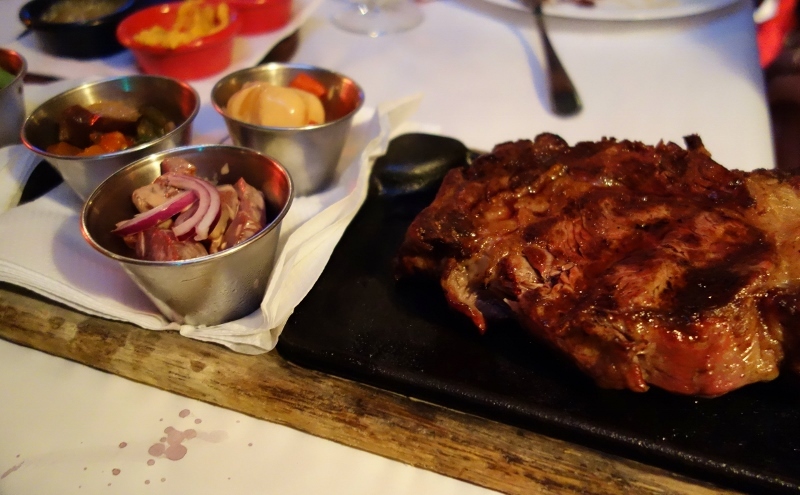 So there we have it: a rundown of all the delicious foods one must try in Argentina. Special shout-out to my Argentine colleague for his advice and letting me use his wise words in this blog post.